The temple of Luxor is full of treasures but many dangers stand before the adventurers who seek to seize them. To succeed in achieving their goal, players will need equipment worthy of the name! This expansion contains 4 different modules that can all be combined with the basic game and with each other. This expansion also provides the possibility to add an additional player for 5-player games. The different modules allow players to acquire special powers, unique starting hands and offer new ways to recover series of treasures. More importantly, this expansion also adds a cursed mummy that players will have to avoid at all costs or face serious consequences. Luxor: The Mummy's Curse was funded on the Crowdfunding Kickstarter (See the campaign) platform on the 31 January 2019, the campaign lasted 17 days. 1,163 people helped funded the game, whose the amount requested was €5,000.00. Thanks to these 1,163 people the game could be funded up to €63,640.00, ~1,272.80%. Be careful this game is an extension of Luxor and cannot be played alone. 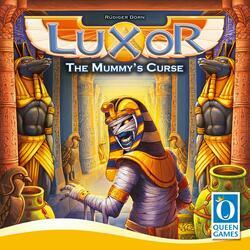 To be able to play it you must have a copy of the game Luxor .